There are a lot of sites/bloggers out there who do extensive reviews of products. They’ll list the “Top 10 day packs” and review them, looking at pockets, zippers, durability of materials, comfort, etc. I’ve dabbled in some reviews myself, but that’s not really my deal. I’ve also done a bit of sponsorships, but find that I’m more interested in using the best gear for me instead of being locked into something where someone is paying me (and I wear their great jacket and terrible pants). Below is a list of what I’ve been using and what I love about it. I do hope to get some video blogs out about these products, but you may be in the market now, so I figured this would be helpful sooner rather than later. All of the gear I purchased myself with the exception of the MindShift camera bag. They sent that bag to me after I asked if they had a pro discount. As far as compensation, see my note below about affiliate linking. 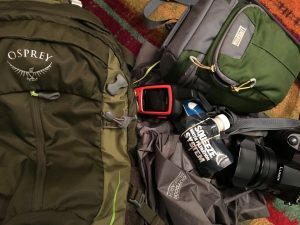 Osprey Stratos 24 – Seriously, Osprey has been getting better and better at making backpacks. As soon as I tried the Stratos on, I knew that I had a replacement for my old Osprey that was gradually falling apart. It’s super comfortable, keeps everything close to my body, great suspension (especially to handle my camera), and swallows up everything I need from a short day to a long 29-mile day. Also includes a stowaway rain cover. Packs are a personal deal though so I would recommend trying them on from a great local shop… then buy it from them for their help, expertise and convenience! Outdoor Research Helium II Jacket – I don’t spend much time hiking in a rain jacket.. in fact, I hate it. When I need one, however, I love it. This jacket is no frills and super lightweight, meaning that I always carry it with me which is what you should always do too! There are no side pockets or vents. It is a feather-light, full-zip, waterproof jacket with a Napoleon pocket, and a hood. That’s it. Sawyer Squeeze Water Filter – Like a rain jacket, hat and gloves, I always carry along a water filter. There are bigger filters that have better flow rates, but much heavier (I’m looking at you Katadyn and MSR). I’ve also tried the UV light based ones, but they too are usually heavier, can only filter a liter at a time, can break/run out of batteries, and work best with a bottle. I love the lightness and simplicity of this filter for how I hike. It’s always with me and works great with any sort of bottle/bladder or you can drink directly from the bag. Also, spring for an extra bag as they can leak over time after many folding/unfolding episodes. The only downside is that getting water into the bag can be a bit tricky, so having something to scoop in the event of seeping water is helpful. Honorable mention to the Sawyer Mini as well which is lighter/smaller, but a bit slower and a shorter life. Garmin InReach Explorer+ – Garmin bought out DeLorme, brought over a sweet product, and made it even better. I used to carry a Garmin GPS for tracking my hikes/seeing where I was, and a Spot Connect to let Kristen know where I was and in case of emergencies. I can tell you more about the Spot’s limitations, but the long and short was that you really didn’t know if a message was sent… and I was carrying two devices. The InReach Explorer+ comes chock full of topo maps and excellent GPS tracking. It also sends out my location at intervals and allows me to send two-way texts. I know if my messages are received and can receive replies. It’s got a long lasting rechargeable lithium battery inside. The screen is a bit smaller than my old Garmin 60Csx, but it’s brighter and has more features. Note that you need a subscription for the emergency features. Panasonic Lumix FZ2500 – This is the follow up to my Panasonic Lumix FZ1000 that I still have as a backup camera (original blog here). Both of these cameras are excellent for hiking/backpacking/climbing. The lens isn’t removable (it’s not a DSLR), but it’s got a great range allowing for good wide-angle to good zoom (24-480mm) on a surprisingly larger 1″ sensor. It also only weighs 2lbs 4oz and shoots excellent 4K video. There are cameras that do better wide angle, better zoom, weigh less, better at low light, etc, but they don’t win as a complete package. The FZ1000 goes for $700 while the updated FZ2500 goes for $1000. If you like shooting great photos and video in the backcountry, but don’t want to haul around expensive, heavy camera equipment, this will do nicely. MindShift Multi-Mount Holster 10 (Amazon) – For my Hike 734 project in 2011, I found a camera bag by ThinkTank Photo to haul around my Canon 7D and a few lenses. Since then, they’ve spun off a smaller, outdoor-focused company called MindShift. They started out with a backpack that was a good idea, but not super great in implementation. I saw that they updated their camera bag featuring quick-release buckles and a few other great additions. I reached out to them to see if I could get my hands on it. They sent me the Multi-Mount Holster 10 and it is a dream for carrying my Panasonic. Protects your camera from the elements, multiple ways to attach to your pack/body, and has a built in rain fly. They have other sizes for other cameras as well. Anyway, that’s some of my favorite gear. Comment below and let me know what other gear you are curious about that I use and some of your gear that you can’t live without! Ron &Valerie here , How’s the thaw in Glacier ? Talked to our ole friend Bob Johnson in Hungry Horse the other day & he said 4’ Of Snow on the ground and highway 2 closed clear to Browning ?WOW …. Anything new in the hiking shoe line that’s of interest , we’ve tried em all … but are about to buy new shoes for this fall …. Have you found a holster mount that gives you quick access to your Canon 7D? May I ask a question about your MindShift Holster 10? You seem uniquely qualified to answer it. I have a camera similar to yours. I hike wet weather a lot, and have had problems in the past with camera bags not being rain-proof enough. That is, the rain flies often do not work very well in extended downpours. On my current one, the rain water will run down the straps, through the strap-openings of the rain fly, and into the holster. Was wondering how well your Mindshift rain fly works in heavy rain? I enjoy your site, and thank you much. That’s a problem for sure. I try not to hike too much in wet weather. When it goes really sideways, I end up just throwing it in my pack. My guess is that the issues might be similar. What bags have you used? Ooops I think I replied back to the whole post instead of directly to you. Please see that post. Currently, my favorite is still my old Lowepro Nova 160 AW. I also have a Miggo Agua Stormproof Quick-draw Torso pack 65 Pro, but that one is just too large, and too hard to open fast for a pic of a bear, a bird, or a flower like I need. I usually hike with other people, so I have to be able to snap those pics fast so I can catch back up. Although it is truly waterproof. Miggo makes some others, but they look similarly cumbersome to open. It’s the waterproof seals on them that make the tops so stiff and cumbersomely designed. I’ve got two ideas on how to fix this situation. One is a rather junky, possibly laborious modification I can make to my Nova (maybe yours would work too). And the other is how these bags should have been designed to begin with. What we really need is something with a similar design to your Mindshift, but with a waterproof bathtub top and bottom (like the Miggos, but without an actual waterproofing seal, rather just the same “cap” design as your Mindshift but that the cap is waterproof from rain (like an inverted tub). So the whole thing would be rainproof, but not waterproof), and no rainfly. It’s hard to believe that no one makes such a thing. Miggo or Mindshift would be good candidates to do create a bag, though.